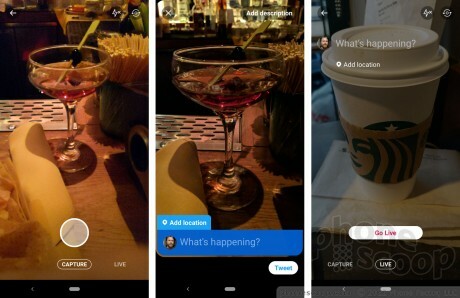 Twitter's new camera function offers an all-new visual interface that makes it faster and easier to share visual content, including photos, videos, and live streaming. The updated app has been rolling out in recent days. A new shortcut takes users directly to the camera by swiping sideways from the main feed. The interface offers standard and live modes. The standard mode has a large capture button that users can tap quickly to take a still, or hold to capture video. Both modes include prompts to add your location and a text comment. There's also a separate prompt to add a description of the visual content for the visually-impaired. The camera function defaults to the phone's rear camera, but supports selfie mode as well. Facebook is making several big changes to how it treats video on mobile devices. First, sound will fade in and fade out as users scroll past videos in their News Feed as long as the phone's volume is turned on. Google plans to add live video streaming to its YouTube mobile apps. Google says live streaming will be incorporated into the application's core and won't require a separate app or download.